After initially announcing its Father’s Day promotion last week, T-Mobile today added one more deal to its promo. 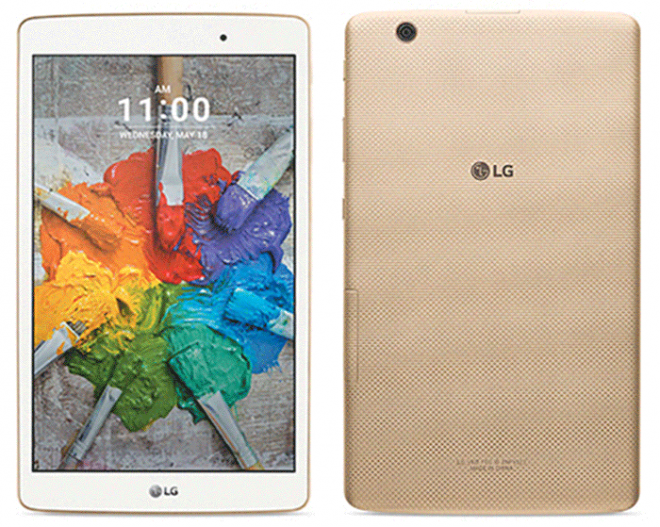 The LG G Pad X 8.0 can now be had for free after rebate. To get this deal, you need to buy the LG G Pad X 8.0 on an EIP and pair it with a data plan 1GB or higher. You’ll then head to T-Mobile.com/promotions within 30 days and enter your phone number, PIN, mailing and email addresses, and the promo code JUNE16TABLET. Six to eight weeks later, you’ll get a prepaid MasterCard card worth $240 to cover the cost of your new tablet. As a refresher, the LG G Pad X 8.0 runs Android 6.0.1 on an 8-inch 1920×1200 display and has 5-megapixel cameras on its front and rear. Inside the G Pad X 8.0 is a 1.5GHz octa-core Snapdragon 617 processor, 2GB of RAM, 16GB of storage, a microSD slot, and a microSD slot for adding more storage. There’s LTE support for bands 2, 3, 4, 7, and 12, too. The G Pad X 8.0 may not be a super high-end tablet, but it’s got a pretty respectable feature set, especially considering that you can get a prepaid MasterCard card to cover its price. So if you’re in the market for a new tablet, this may be a deal to jump on. You can do so right here. So if I pay this off early can I just cancel the mobile data? exact same question here. assuming rebate takes a max of 8 weeks (often just 5weeks) then the cost of this pad is essentially just be the cost of 2 months data price. i’ll give tmobile a call tomorrow to confirm. Slick deals guys say it’s a go. I was told to not pay it off until I received the rebate, though the rep at the store said he didn’t know for sure. Its like all the other do this get this free promos lately. You have to keep the line for a min of 3 months or you risk T-Mobile charging your account the cost of the rebate. The rebate takes up to 3 months to get to you anyway. The Samsung free Galaxy took almost 11 weeks for me. Also I found the previous tablet is now worthless. They give you nothing for it. If you really wanted or needed the 24 month service then it was a good deal. The “3 months of service minumum” with the rebate was good too. Now it doesn’t say anything about how long you have to keep the new line open. So it’s not only the rebate the issue. I was told you have to add a line, but the promo does not say that. You have to add a data plan which is what the site is considering adding a line. I did it $20 over the course of 2 months plus fees and taxes isn’t bad for a free(ish) tablet. No you have to add a line, or you will not get the Visa card. I just checked with the store. Nice tablet too, I have to first gen and wanted this one. But I’m not adding a line. No you don’t have to add a phone line, you only have to add a data plan, I already have the tablet in my hand and submitted the rebate process without issue. Whoever told you different was wrong. The terms don’t say anything about adding a new line.. just that it needs to be on a 1gb or higher plan. I just called and checked with a phone rep, and they indicated the same. Upgrade or new line. They did say to make sure you keep whatever line it is on active until youhavr the rebate card in hand. And, make sure you put it on an EIP plan..
Don’t need this… but its free… how do I not get it…? it’s not free. you have to pay for the mobile broadband service for 24 months. After you get the rebate you can pay it off… and then cancel the service… as far as i can tell. I think you may be right. Previous tablet offers you had to pay remaining balance of tablet if you didn’t go the whole 24 months paying MBB. Someone at tmo’s gonna get fired for this OOPSy language. If at the store they tell me I can cancel anytime after the rebate, I’m gonna ask them to put that in writing. I’m not looking for freebies, I’ll keep the line for some 8 months at least, but I don’t want the 24 month agreement either. My sales person looked it up and said the line needs to be active for 120 days. Still a good deal. Equipment Installment Plans is the only sort of 24 month agreement that is possible to agree to now. If you pay it off with the rebate, then the 24 month agreement for payments is terminated because the device balance is paid off. You have 14 days from the day of purchase to return the device. And if you don’t want issues with the rebate make sure they do it like a return of the G Pad F and a new purchase of the X. Also ask them for how long do you have to keep the line active to not trigger some sort of penalty; someone said 120 days. Let us know. You don’t have to wait. They told you that because if you cancel it they will be charged back on the commission. I have $10 5GB MBB. You can upgrade ur current mobile internet line. Still qualifies. You have a add a line to get this promo. After 2 months I will switch the tablet to my free data line. Its my 4 year olds tablet and he doesn’t use much data (yet). I got one. I downloaded the T-Mobile app for this thing but it’s the old version. The tablet consumes a lot of background data, I see the Google apps are the ones to blame, had to disable and turn off background data for many apps. I would like to know how to enter short codes, if possible. I went to my local store on 6/17 and the store had none, but the store had none of the LG tablets. They ordered one for me, but now I see the status shows “Backordered”. I do not have any experience with TMobile and ordering for home delivery… crossing my finger that the order eventually gets fulfilled. I got one at local corp store. I recommend everybody who has MBB, especially got the grandfathered $10 5GB one, to buy it and get the rebate. It’s much better than F.